Sometimes the best books are not the ones you get the most amazing reading experience from. But, the ones that touch you at the right time or season in your life. Trader by Charles de Lint fits that description. Words of wisdom from a conversation near the end of the novel where one of the minor characters, Tanya, is getting advice on pursuing a career as an actress. Also, the quote sums up how one should view art and having it revealed through a character is the best way to bring home a truth. Truth. Identity. Those are the main themes in Trader. Max Trader is a luthier, maker of guitars and has created a comfortable life for himself in the fictional city of Newford. (De Lint has written a series of novels based in Newford and all are worth checking out.) Johnny Devlin is a ne’er-do-well living on the edge in the city. Somehow, both men’s identities get switched and they live life in each other’s bodies. Johnny assumes Max’s life without no trouble. While, Max becomes homeless, poor, friendless, and has to pick up the pieces from his new identity. De Lint does an excellent job in using both first person (for Max) and third person (for Johnny and the other characters) to create a sense of how switching identities would effect both men and the people in their circle of friends. Also, there is several subplots with some of the Newford characters that have appeared various books and a mother and daughter who have lost connection with one another. All the characters were engaging, believable and kept me turning the pages. I have to admit that I was a little disappointed in how De Lint resolved the switching identities of both men as they entered the spirit world based on a combination of Celtic and Native American mythology. I had a different expectation on how that issue would be resolved and De Lint took it in a different direction. 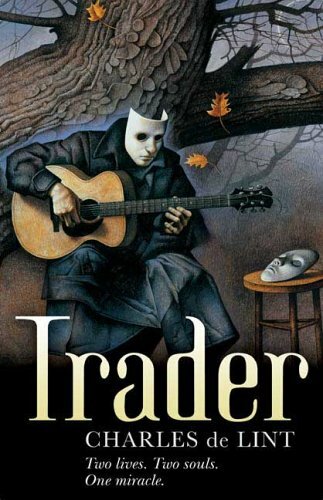 Beside that issue, I enjoyed Trader and it brought me back to when I read a lot of De Lint novels in the mid 1990s as a bookseller. It had been a long time since I’ve read a De Lint novel, and it did not disappoint me all these years later. Trader is one of my favorite reads of 2016 and I recommended it for fans of contemporary and urban fantasies.